Here is this week's edition of Tough Call. 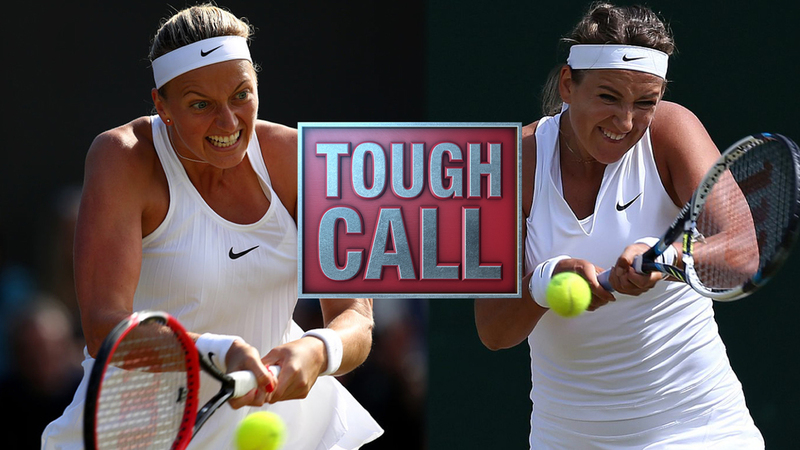 Who will go further at Wimbledon – Victoria Azarenka or Petra Kvitova? - Azarenka has always done well at Wimbledon, her best results being back-to-back semifinals in 2011 and 2012 (losing to the eventual champion both times - Kvitova in 2011 and Serena Williams in 2012). She’s been to the quarterfinals another two times. - Azarenka is best known for her results on hardcourts, winning two Australian Opens and reaching two US Open finals, but she’s one of only four players who’ve made the semifinals or better at all four majors (with the Williams sisters and Maria Sharapova). - Azarenka’s road back to the top has already begun - she made a winning return as a mother-on-tour on Tuesday, beating Risa Ozaki in her comeback match in Mallorca. - She’s had a few more matches than Azarenka to get her groove back. Kvitova came back to the tour three weeks ago at Roland Garros, reaching the second round before losing to Bethanie Mattek-Sands in an incredibly close, incredibly high-quality match. - Wimbledon is by far Kvitova’s best Grand Slam. She had her big breakthrough there in 2010, reaching her first Grand Slam semifinal - where only Serena Williams was able to stop her - and both of her Grand Slam titles have come there, in 2011 and 2014. - Kvitova looked great in her first grass court match of the year in Birmingham, cruising past Tereza Smitkova - who’s been to the second week of Wimbledon - in straight sets. Kvitova has her two Centre Court titles and is the more accomplished player on grass so I give the nod to her over Azarenka, who will be a serious threat at the U.S. Open. Kvitova is the better player on grass for sure, but since it’s not about who’s better on grass, my pick is Azarenka. Unlike Kvitova who’s still healing from a knife attack, Azarenka is fit and ready to go. Even though she’s never won Wimbledon, she’s reached the business end of it, making two semifinals. Without Serena in the mix, there’s no reason Azarenka can’t go all the way. A lot will depend on the draw—both of these out-of-form, two-time Grand Slam champions could lose early. But it’s harder to see Kvitova, whose two major title victories came at the All England Club, losing earlier than Azarenka, who doesn’t have the Czech’s point-ending serve. Personally, I say let them meet at Wimbledon, so they can decide for themselves. While Azarenka is the better player in general, Kvitova is the better player at Wimbledon. The Czech loves nothing more than playing on Center Court, where she has won two titles. Both players are making comebacks, but Kvitova, who returned at Roland Garros, will likely have a few more matches under her belt. At this point, it’s just a huge relief to have both of them back playing. Given that Kvitova has three matches already under her belt (two of which are wins) and is a phenom on grass, she gets the edge. Azarenka, at first glimpse at least, is looking fitter and happier than ever. She’ll be a force as well, but may be one small step behind the Czech. All of the logic points to Kvitova, who’s played more matches since her return and is a two-time champion at Wimbledon. The Czech, however, has admitted that she’s not fully healed, and it could be a long time before she’s 100 percent. Azarenka is healthy and, before they stopped playing, was performing at a much higher level. With the state of the WTA being what it is, Azarenka is already a title contender.